You usually get patches of small bumps on your arms, thighs or bottom, but they can appear in other places. See more about skin rashes in adults and skin rashes in children. 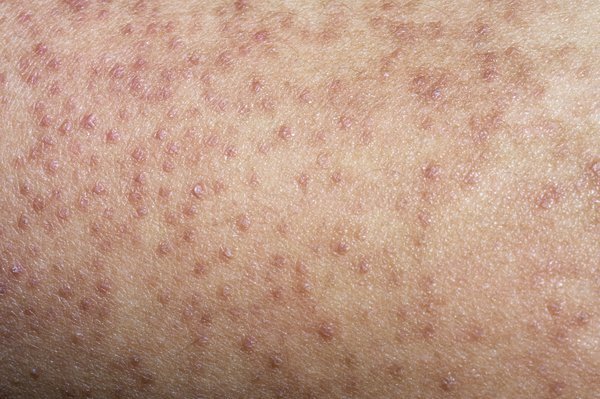 Most people with keratosis pilaris have it for years, and it may eventually clear up by itself. Until it does, there are things you can do to help improve the appearance of your skin. They can recommend creams or lotion to help your skin. They can also tell you whether you need to see a GP. Keratosis pilaris happens when your hair follicles become blocked with a build-up of keratin – a substance found in skin, hair and nails. Nobody knows exactly why keratin builds up, but the condition is thought to run in families. So if your parents have it, you may get it, too.